The Civic and Accord are among the best-known model names in the entire auto industry. The Honda Accord was introduced in 1976, three years after the Honda Civic went on sale in the United States. Initially a compact car, the Accord has grown through the years and is now categorized by the US EPA as a large car. For competition purposes, it is still considered a midsize model, with the Toyota Camry, Nissan Altima, and the Ford Fusion among its chief rivals. Other models to consider include the Hyundai Sonata, Chevrolet Malibu, Kia Optima and the Mazda6. Through the years, Honda has offered the Accord in sedan, hatchback, and coupe body styles. Even today, the Accord remains the lone model in the segment to offer a coupe, although the hatchback is long gone. Honda also offers something else that is becoming nearly impossible to find: a 6-speed manual transmission. Honda offers the Accord Sedan in LX ($22,205), Sport ($24,265), EX ($25,580), EX-L ($28,670), EX-L V-6 ($30,745), and Touring ($34,680) trim levels. Add $800 to the first three editions to upgrade to a continuously variable transmission, what is standard on the EX-L on up. The first four editions are also powered by a 2.4-liter four-cylinder engine making upwards of 189 horsepower at 6,400 RPM and 182 foot-pounds of torque at 3,900 RPM. The two top trim levels are powered by a 3.5-liter, V-6 engine making 278 horsepower and 252 foot-pounds of torque and paired with a 6-speed automatic transmission. That’s just the combination I found under the hood of my recent test model, a 2016 Accord four-door sedan — specifically, an EXLN Sens V6 edition. The added letters “N” and “Sens” are important. Models with an “N” bring in navigation and those identified with “Sens” have Honda Sensing, a collection of safety features. More about Sens later. We’re up to the ninth generation for the Honda Accord, the most recent model was introduced in 2013. For 2016 it received a mid product cycle update, including updated front and rear fascias with the expanded use of LED lighting. Honda also tweaked the chassis to make it more rigid and by adding new shock absorbers and a retuned electric power steering system. Other changes brought in the first application of 19-inch wheels, where available; a new 7-inch color display audio with Apple CarPlay and Android Auto; a newly available 60-40 split-folding rear seat; heated rear seats, rain sensing wipers, and parking sensors. In addition, the coupe body style now offers the top-of-the-line Touring edition, matching the sedan. Honda is a fairly new supplier of vehicles for my test fleet, but its stellar reputation precedes it. I remember when the first Honda models were sold in the US. I also recall when my friends began to switch in droves to Honda products in a bid to find more efficient and better built small cars. Invariably, mention “Honda” and “Toyota” also comes up — both companies have earned their lofty reputations. 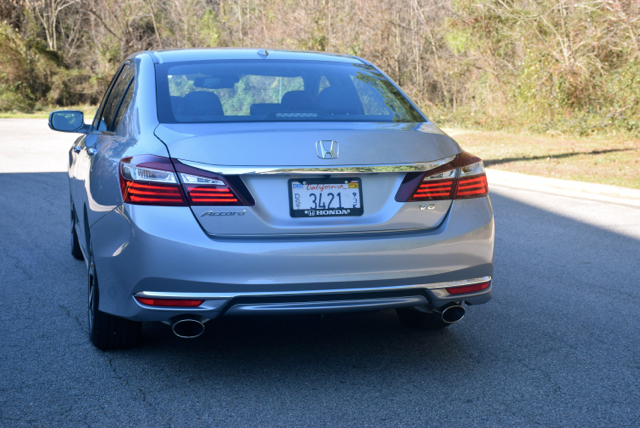 The most recent Accord model may surprise you, a sedan with a stately appearance. Its front end is marked by a chrome-bedecked grille and flanked by wraparound headlamp assemblies with LED daytime running lights. A sporty lower fascia includes large embrasures housing the available LED fog lights. The Accord’s profile is marked by an ever so slightly rising belt line, a sloping roof line and by a pair of distinctive upper and lower character lines. 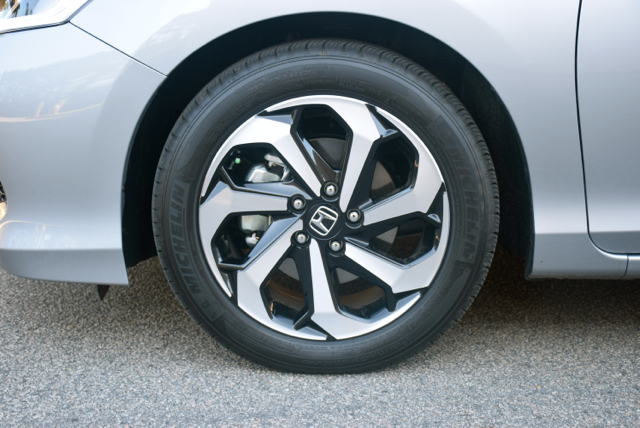 My test model was outfitted with unique 17-inch alloy wheels for a high-end touch. The Accord features a raised rear deck with wrap around combination lamps. This edition also has chrome embellishments, rear reflector lights and dual exhaust ports. 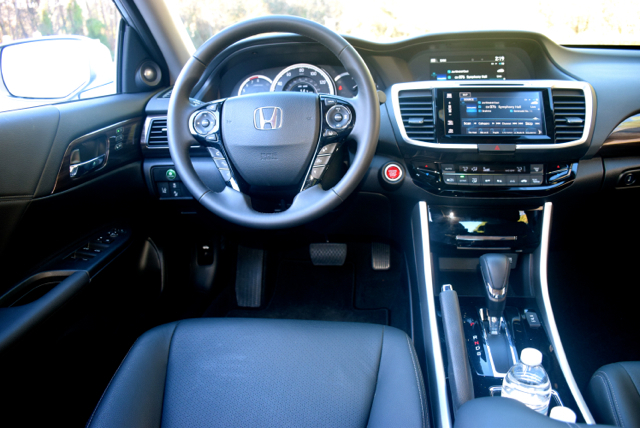 As Honda’s flagship sedan, the Accord makes available such amenities as push button start, dual-zone climate control, leather-trimmed seats, and a 10-way power driver’s seat. 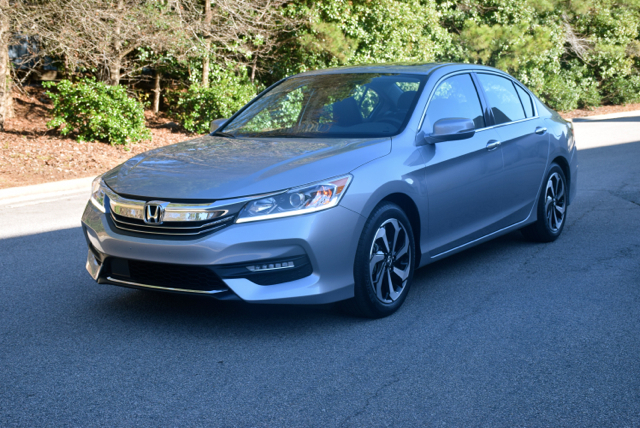 Regardless of the model, all Accords offer generous standard equipment, including alloy wheels, daytime running lights, automatic headlights, a rear view camera with guidelines, and Bluetooth connectivity. You also get power accessories, a tilt and telescopic steering column, cruise control, a sunglasses holder, driver’s and front passenger’s illuminated vanity mirrors, map lights, and a cargo area light. Available amenities include keyless entry, push button start, a leather-wrapped steering wheel, steering wheel-mounted controls, a power moonroof, heated seats, and leather seats. The Sport edition brings in aluminum pedals. The Accord’s instrument panel is dominated by a large speedometer dial with a tachometer on the left and a dual oil/fuel gauge on the right. In the middle of the speedometer dial is a small, digital screen displaying such driver information as the outside temperature, odometer, oil life remaining, and safety features. The center stack features not one, but two color displays. The top display is for the audio system, the bottom display is for telematics and also features finger swipe controls for the audio system — not my favorite design, but you’ll get used to it fairly quickly. The rest of the center stack is composed of switches to manage the climate control system, a closed storage compartment with a USB port, and an open storage area with a 12-volt outlet. Between the front seats is the transmission shifter, flanked by the available heat warming switches. A pair of cup holders, the emergency brake, and the requisite covered arm rest/storage compartment are also present. That latter compartment is also where you’ll find another USB port and a second 12-volt outlet. The Accord is designed to hold five people and it does so without compromise. The driver’s seat is very comfortable and all controls are at the ready and easily decipherable. 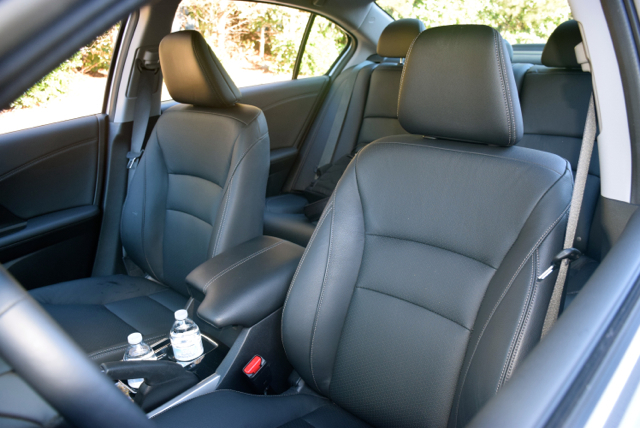 The test model has premium touches throughout, including leather, wood trim, aluminum, and soft touch materials. 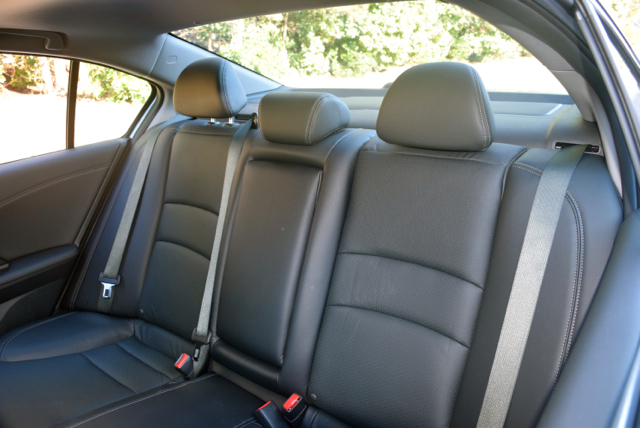 The rear seat is roomy with excellent head, shoulder and hip room. Even legroom is sufficient and that’s important in this segment. The test model had a fixed back seat; opting for a fold down seat makes sense, especially if lugging the occasional yard sale find is part of your experience. The Accord comes with drink holders and storage compartments in each door. Two cup holders are up front and another two are in the back. Under the cargo floor is your spare tire, a temporary one at that. When it comes to safety, the Honda Accord has you covered. You get the usual traction control, stability control, brake assist, electronic brake distribution, and anti-lock brakes as well as the aforementioned rear view camera. Also available is forward collision warning, lane departure warning, collision mitigation braking, and a road departure mitigation system. But Honda doesn’t stop there. Lane keep assist and adaptive cruise control are two of the four driver-assist or Honda Sensing technologies available across the model line. Honda LaneWatch and automatic high beam headlights are also available. All four are included with the Touring edition. My favorite feature is Honda LaneWatch, one that increases visibility on the right side of the car when the right turn signal indicator is activated. Specifically, a camera mounted below the right outside mirror turns on and gives you a wider view of the road behind you with that moving picture displayed on the center screen. Honda calls LaneWatch a “visibility enhancement;” I call it one of the best safety features available in a mainstream model. V-6 engines have few takers in the midsize segment, if they’re offered at all. Mazda, Ford, Chevrolet, and Hyundai are among the manufacturers without a V-6 — each relies on normally aspirated and turbocharged four-cylinder engines instead. Honda’s V-6 should be familiar with the brand faithful as it is standard in the Odyssey minivan, Pilot SUV and will also power the upcoming Ridgeline midsize pickup truck. 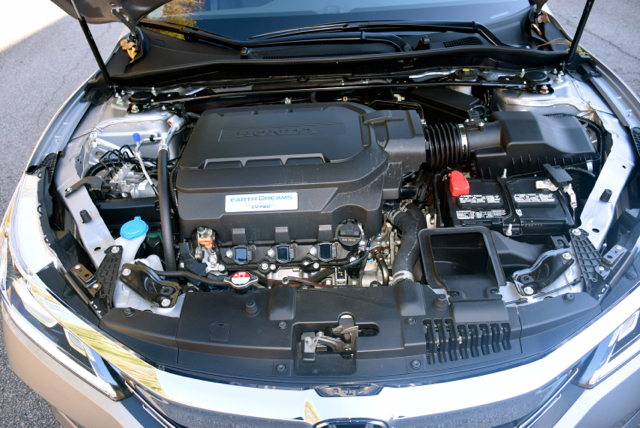 Its a strong motor at that and in the Accord it provides more power than what most shoppers will need. Surprisingly, torque steer is not a big deal in this Accord. You’ll feel a slight tug when applying full power, but the front end remains composed. Honda must have found the right combination of steering feel and engine revs to mitigate the sensation. Off the mark acceleration is excellent and the V-6 will have you roaring down the highway in no time. The ride is smooth and quiet — I’ve driven a host of luxury sedans and the Accord compares favorably. The sedan feels solid, the steering is about average but is far from numb. 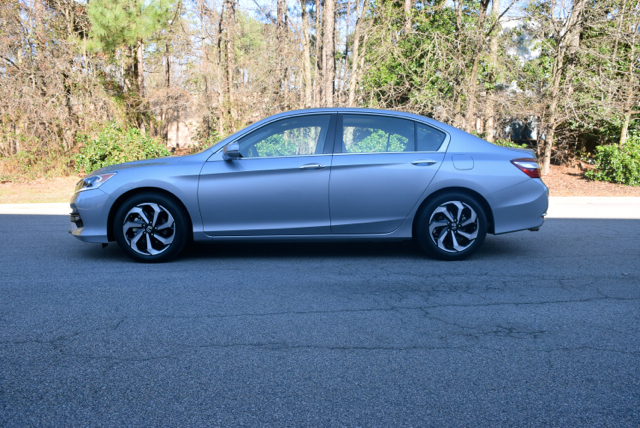 The Accord certainly doesn’t tackle the curves with deftness — at the same time you won’t find yourself fighting with the steering wheel and tapping on the brakes to maintain control. Braking is firm and uneventful. The midsize sedan segment is what it is largely due to the work of the Honda Accord. This model has set the bar for how an American family sedan should look and perform, effectively requiring competitors to tow the line or get left behind. Furthermore, the top end of the Accord range presents a complete package with style, quality, reliability and a premium experience provided. Honda Accord photos copyright Auto Trends Magazine.